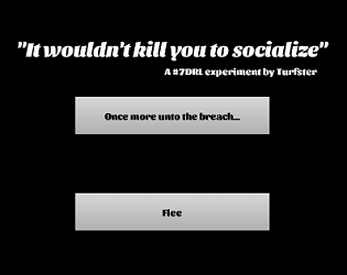 "It wouldn't kill you to socialize"
"It wouldn't kill you to socialize" is an experimental roguelike where you play an introvert at a big family party. You need to get through the list your parents gave you of people to talk to before you can get back out of the main room to where you feel more at ease. Unfortunately, all kinds of family members want to talk to you, even if you don't really want to talk to them. Warning: quite a lot of people were supremely creeped out by and uncomfortable with videos of me just walking through it, and the 'final' released version feels even darker, so... be careful. I ran out of time at the end, I'm afraid. I couldn't finish balancing it and writing more dialogue for it, so you can't really 'lose' the default 10x10x3x3 random grid. However, if you pass the command line parameter RANDOM along, it'll generate a new grid with variable size and number of tasks and people you don't really want to talk to, which could actually be challenging.